This entry is being posted a bit on the late side, trying to get the archives unloaded here! The Northgate area of Walnut Creek isn’t usually a destination for people who live outside the area. The only reason I ended up at Evie’s was that my dad and I were early for a home inspection, and I’d noticed this place online before. Evie’s screams rural roadside drive-in. Put this place in any small town in Texas or the midwest, and it’d be the go-to hangout. Not that Northgate is by any means the “old” Walnut Creek, but given the never-ending makeover of downtown, the east side of town has begun to feel…older. In a sense, Evie’s fits better here. (Note that Evie’s itself is a restaurant in a generic plaza, there’s no drive in or anything – it’s just the emotion that was evoked once I was inside). So I’ll have to invite you to picture what the inside of Evie’s looks like, as I didn’t want to be too foodie crazy during a work lunch. But suffice to say it’s a fairly typical diner, with big old menus behind the order-at-the front cash register. The first thing you really notice is the price. On a budget? Hamburger and fries is $4.60. Feeling splurgy? A large order of fries and double cheeseburger will run you…$6.80. 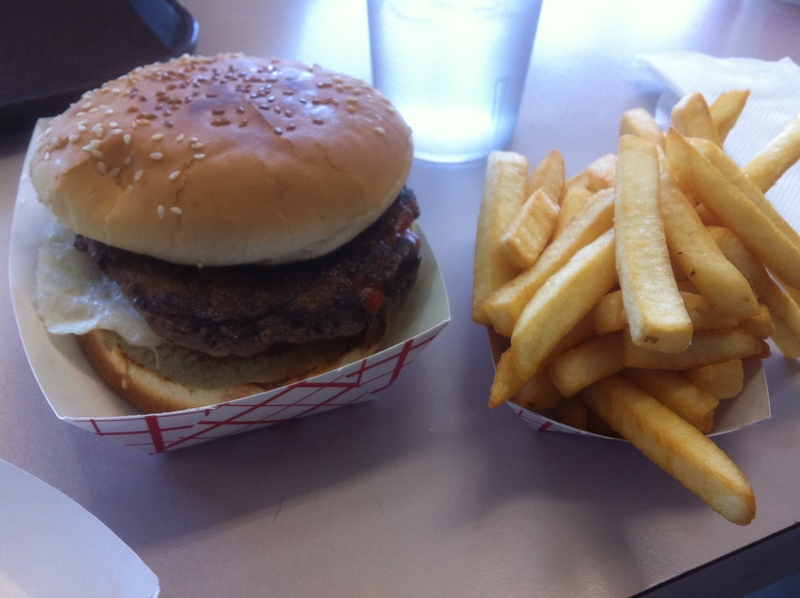 In this particular case, I opted for a double hamburger with a small side of fries, for $5.60. Food came pretty quickly, about as I expected for a half-full burger place around 1 PM on a weekday. My first impressions of my meal were what evoked the images of the roadside joint – simple food served in the red-striped boats. Thin broiled patties with sesame seed buns and thick golden fries. Brought back memories of a roadside place near my home in Connecticut in the 90s. So with all this nostalgia, how good was the actual burger? My double hamburger had its ups and downs. In hindsight I wish I’d ordered a double cheeseburger, due to the cooking of the patties. Often, people will press the spatula down on the burger patty while it’s on the grill to cook it faster. The problem with this practice, especially with thin patties, is that all the good stuff is getting pushed out of the burger, and you’re left with a dry, overcooked flimsy thing. Unfortunately, that’s a NEGATIVE memory I associate with roadside drive-ins, so my nostalgia was augmented in this regard. The patties were definitely thin. They had that nice charbroiled taste on the outside, but the inside was pretty clearly overcooked, and quite dry. I can’t help but think a spatula was pushing them up against the grill for too long. As a result, the burger was quite bland – the nice char on the outside just couldn’t compensate for the grey interior. Unfortunate, really. Some cheese would definitely have mitigated the dryness and blandness, but ultimately I’d just prefer a properly cooked burger. If the patties were cooked properly, with some cheddar cheese melted over them, I could see a huge improvement in my opinion, since I’m a sucker for a bargain, and the prices here are second to nothing but In-n-Out. Sizewise, I have a big appetite, so the second patty is a must in my book, as a Big One isn’t really very big. A Double Big One, however, is a good size, and I recommend the double side of cheese added to it. You can see for yourself in the above picture that the portions aren’t very big; that said, they’re more than fair for the price. Not too much to say about the fries. They’re pretty standard thick cut fries. If I had my guess, I’d say they’re frozen, but you can escape with that if they’re fried well. They were fried well, but were quite lacking in salt. Yeah, big deal, so I salted them on my own at the table, but shakin’ them up in a silver bowl with some salt really would’ve elevated all that soft potato inside the fried outside, since they pretty clearly understand how to fry potatoes to perfection! There’s not much in the way of service, since you order at the counter, and the only real interaction after that is the serving of your food in those iconic red striped boats, but I get the feeling that Evie’s is a family affair, and the staff seemed to enjoy what they were doing. It was a quick lunch, but I like what Evie’s represents, and I think there’s some potential here. It seems like they have a pretty loyal following, and for people who do live out in the back of Walnut Creek, this is one of a couple good restaurants nearby. I don’t think I’d come back again unless I’m in the area, but if you’re feeling nostalgic for simpler times, I’d definitely recommend Evie’s to you.